What do you do when it is slow?? 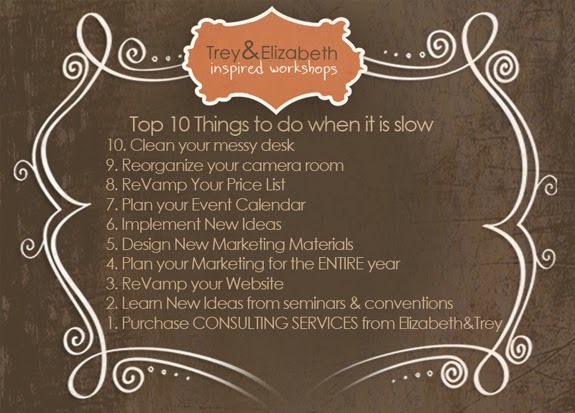 When it is slow at your studio or home business, what do you do? Do you go to lunch everyday with friends? Catch up on the TV you missed during the Christmas Rush? Do you wonder how other photographers stay busy year round? Well, after 22 years in this business, I have NEVER figured out how to get portrait sessions in the door during the months of January and February. I have run every special known to man and it JUST DOESN'T WORK!!! So instead of fighting the inevitable, I give myself many projects to do. My list is a MILE long and I am as busy now as I was during the Christmas rush. Only this is a different kind of busy. The Top 10 Things I DO when it is slow is listed in the above graphic. One of the things on my list, is to make a better effort to keep this blogsite up to date. As I am a working photographer who teaches on the side, this site always tends to fall to the wayside when things are busy. So now I have said it and I guess I need to make it happen. So, instead of wondering what you are going to do today.....MAKE A LIST!!! Every day work on ticking things off that list. Some of these "projects" may take an hour, and some of them a week or more. The thing is, if you don't write it down and hold yourself accountable, it will NOT happen. I want 2014 to be a VERY PROFITABLE year for me! I have three BOYS to feed. I have to pay for their basketball, new shoes every month it seems and OMG....COLLEGE! Trey and I make a LIVING doing photography and we HAVE to be profitable or else we may be living out of our car! We want YOU to be profitable too! If you need help organizing your thoughts, or you don't even know where to start, consider purchasing our CONSULTING SERVICES. As much as I would love to take every photographer's call or email asking my advice on all of the issues they are having, I can not do this for free. My time is valuable, as is yours. This is a wise investment of your time. One on One with either Trey or Myself. Check out the details about our CONSULTING SERVICES. So, go get a sheet of paper and make a list of ALL the things you need to do. Then take the TOP 10 things that you think are MOST IMPORTANT to the success of your business. Prioritize those and get to work! Here is to a HUGELY SUCCESSFUL 2014!